Hyundai and Kia win six awards at Red Dot Design Award. April. 10, 2018 07:50. by Eun-Taek Lee nabi@donga.com. Hyundai Motor and its sister company Kia Motors swept six awards at the Red Dot Design Award this year, which is one of the three biggest design competitions in the world. Kia Motors’ Stinger was crowned Best of Best in the transportation design category, the company said Monday. Hyundai Motor’s fuel cell electric vehicle (FCEV) Nexo and subcompact SUV Kona, and Kia Motors’ compact sport utility vehicle Stonic and Morning also won the award. 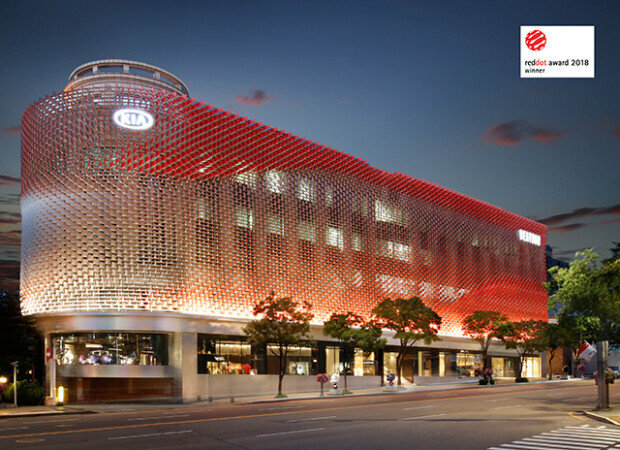 In addition to vehicles, Kia Motors’ brand experience center BEAT360 that opened in June last year was named the winner of the interior architecture and interior design category. The center had also clinched the iF Design Award early this year. Kia Motors is planning to exhibit three of its new flagship K9 sedans at the center while presenting diverse contents. Meanwhile, Kumho Tire’s Wattrun VS31 designed for electric vehicles was honored with an award in the concept category. With the latest accolade, Kumho Tire has become the first tire manufacturer of Korea to be awarded for seven consecutive years since 2012. The Red Dot Design Award, arranged by the world-renowned Design Zentrum Nordrhein Westfalen in Germany every year, decides its awardees based on a variety of criteria including design’s innovativeness and functionality. The product design category saw heated competition this year with around 6,300 products from 59 countries.